Smart Panels can provide builders with a complete weather-tight, super-insulated, airtight shell in a matter of days—not weeks. Trades can complete high-performance builds up to 50% faster, and with 50% or better performance than conventional timber frame construction solutions. Smart Panel wall cross section above – external batten for cladding and optional internal panel cavity, or internal batten void for electrical services. For energy efficiency plumbing is recommended to installed via the insulated foundation and run through standard internal timber frame walls or an internal cavity batten. There is a 10 step process to follow. Using Smart Panels is much simpler, takes far less labour, and delivers insulation R-values far superior to that of conventional timber frame builds. Standard insulated foundation or pile structure installed. Threaded rods are used for fixing bottom plates in the concrete foundations. While you prepare your foundations, your house is being built in a factory—that's efficiency! Fix bottom plate to concrete or pile floor system as per engineer and architects drawings. Make sure the foundation is clear of debris & dust that could affect air tight with base plate. We recommend using bottom plates timber that is less susceptible to swelling like laminated framing. 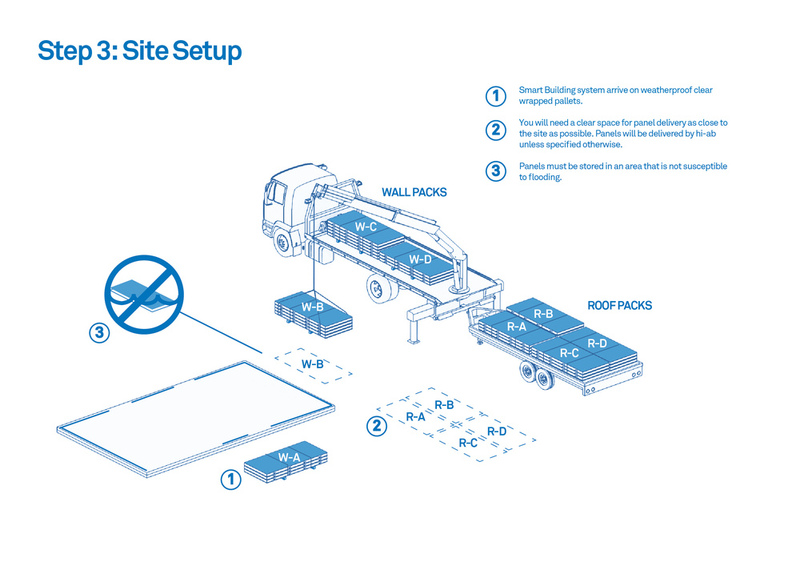 Smart Building system arrive on weatherproof clear wrapped pallets. You will need a clear space for panel delivery as close to the site as possible. Panels will be delivered by hi-ab unless specified otherwise. Panels must be stored in an area that is not susceptible to flooding. Layout SmartWall panels and window footers as per the supplied panel plan around the perimeter of the pad. Start on Corner 1 and work in the prescribed direction. Stand up the two Smart Wall corner panels onto the base plate.Once plumb and level temporary screw fix to base plate then brace as per diagram. With supplied foam guns spray a line of foam on both panels joins and the base plate. Lift the Smart Wall panel into position and slide as close to the adjoining panel as possible. Use mallet with protective woodblock if panel sticks on base plate. Tighten the Smart Wall panel with the cam locks, starting at the top. Then temporarily fix internal and external face of the panel to the base plate at each end using supplied screw holes. Check the panels are true & level and repeat until wall section is complete. Brace panels as where builder see fit and for weather conditions. Smart Wall Panels come with an adjustment panel per wall length and corner join. This can help manage any unforeseen minor variation in foundation and bottom plate dimensions. *Key note for large openings it is recommended you brace either side of the header until the Smart Wall system is completely fixed off. Once you have erected all Smart Wall Panels, again insure all panels are straight and true. Use bracing equipment to lock the Smart Wall panels in place. Fix a string line 20mm off each corner running the length of each Smart Wall panel. Prior to fixing your string line ensure corner is plumb. Place the supplied laminated timber top plates across Smart Wall Panels as per the plan, fix the top plate at 150mm centers with the supplied 65mm D head ring shank nails. Ensure the top plate provides a continuous flat/even surface for the second story or roof install, and use packing if necessary before applying the Adhesive Smart Tabs. Fix the Smart Wall Panels to the base plate at 150 mm centers using the supplied 65mm D head ringshank nails and all no camlock header and footer wall joins at 150mm centers. Have required scaffolding in place, then install floor joists and mid-floor as per the engineer & architect's drawings. Use a hi-ab or telehandler to lift panels packs onto the second story. Install second story bottom plates and fix as per the engineer's drawings. Repeat the install process of the ground floor, but using internal bracing onto mid floor. Gables fit together like header and footer panels fixing male and female panels together with supplied 65mm D head ringshank nails at 150mm centers. Fix stop blocks to the Smart Wall Panels top plate to ensure panels do not slide down wall when lifting. Affix the supplied eyelets to the panel to be lifted. Panels to then be lifted into place via lifting irons and a Hi-ab. Take your time to ensure the panel is correctly placed and then fix off with supplied purlin screws at 300mm centers. Fix screws on angle through Smart Roof end plates onto the wall top plate and ridge beam. 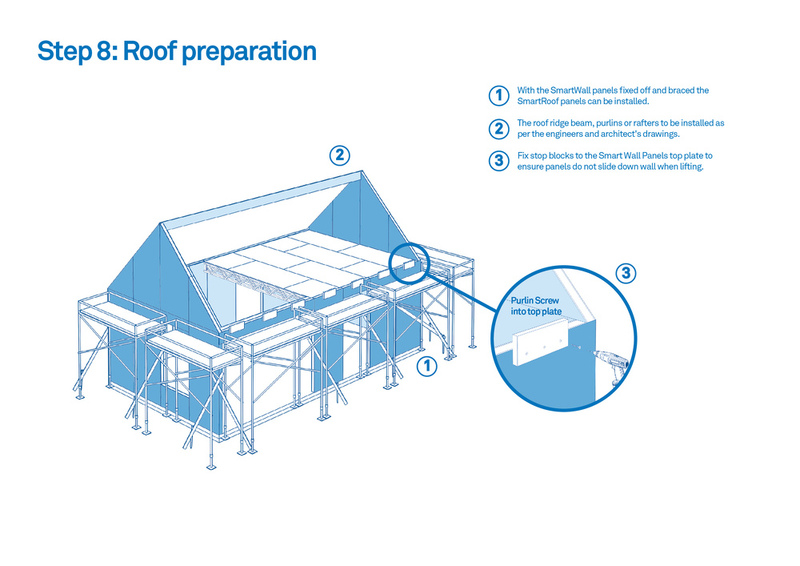 On all Smart Wall Panels and Smart Roof Panels apply the supplied wrap tabs & tapes over the exposed panel joins, base plate connection point, nail holes and penetrations to ensure weather and airtightness. Remember to cover all new holes caused by bracing with supplied tapes. Roof panels are supplied with marked internal battens as per requirements for fixing roofing iron. Last minute design adjustments on your build site? Being a local manufacturing operation, if customers have a significant last minute revision, or variation that can’t be resolved on site during the install, new Smart Panels can be produced quickly and delivered to site for installation. We have a number of recommended professionals of who have experience in design, build and engineering with Smart Panels. If you need wish to build a team please visit our recommended professionals contact details page to find out more.